The Visual Thesaurus is a 3D interactive reference tool, powered by Thinkmap, that gets students of all ages excited about words. Using our visualization technology, the Visual Thesaurus takes a unique, and remarkably beautiful, approach to presenting the results of a word lookup. The Visual Thesaurus creates an animated display of words and meanings  a visual representation of the English language. The Thinkmap visualization places your word in the center of the display, connected to related words and meanings. You can then click on these words or meanings to explore further. The Visual Thesaurus moves beyond strictly synonyms to display and animate connections among word definitions, multiple word meanings, and even antonyms. A user can broaden and narrow search interactively by selecting parts of speech or type of relationship among the words displayed. Color, shape, and rollover displays enhance both the usefulness and beauty of its visual representation of the English language. The Visual Thesaurus provides guidance and inspiration for anyone interested in words and conversation  writers, professionals, and students. Through its emphasis on exploration and vocabulary building, the Visual Thesaurus improves reading, writing and communication skills. Available to both institutions and individuals, the Visual Thesaurus product can be purchased as a Web-based subscription. 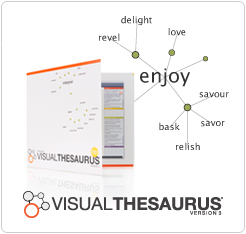 More information about the Visual Thesaurus is available at www.visualthesaurus.com.